Snippets of Jack: "As Thick As Theives, Love"
"As Thick As Theives, Love"
Jack and Angelica are two ambitious pirates who have their minds set on the Fountain of Youth. But neither of them know exactly everything that is needed inorder to gain eternal life. So Angelica and Jack meet up in a bar (of course). After some pretty intense bar fighting, they find themselves soaked sitting on the dock. Angelica cuts right to the point. Angelica: "So, what is it?" Jack: "What is what?" Angelica: "About the Fountain. What do you know?" By now she's got her knife ready for action. As Jack dumps out the gallons of water from his boot (how much is in that thing??? ), he quickly give up his information. 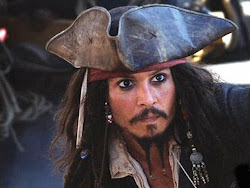 Jack: "You don't happen to be in possession of two silver chalices, circa Ponce de Leon?" Angelica gives a short look of delight. Angelica: "No." Jack: "Ha. Thought not." Angelica: "Why?" Jack: "I hear stories. Rumors. You are of course, aware of the ritual." Now it's Jack asking for information. Angelica: "Yes, I am." Jack: "Hmmm. What is it? What is required?" Jack has to wait for that vital piece of the puzzle, because kind Angelica has her hit man shoot him with a dart that knocks him out. So then Jack's knocked out body gets kidnapped onto the Queen Anne's Revenge, but Jack still needs to know of the ritual for the Fountain. 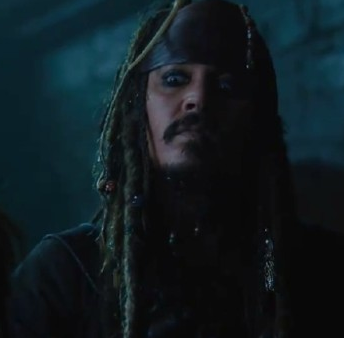 If he's going to sail all the way out there to save Blackbeard, he might as well gain immortality as well. So he decides to charm Angelica into giving him the last peice to solve the puzzle. Angelica: "You can be so charming when you want something, Jack. The trick is finding out what." Scrum, who is playing his banjo in the background intensifies the music. Jack: "The truth, then, is it? Blackbeard has served his purpose. You and I can go to the Fountain together, where we shall bathe one another in equal shares of fame and other assorted debaucheries." Sounds tempting. Angelica: "And I"ll tell you the ritual of the Fountain." The continue to dance around the deck. "Yes. The profane ritual." Angelica: "Can I trust you, Jack? I need you on my side." And now they are on the ground . . . Jack: "Oh my dearest Angelica. You and I are as thick as thieves, love. Tell me the rules." Man, things are getting really desparate. Angelica seems to give in. Angelica: "Water from the Fountain of Youth. The shimmering tear of a mermaid. The silver chalices of Ponce de Leon. With these items." Jack: "Yes?" Angelica: "With these items, you may take all the years of life from another, Jack." This seems to change things as Jack quickly sits up. Jack: "Eh?" Angelica: "You know what that means. We cannot go alone, you and I. The ritual requires a victim." Well you could, just one of you would have to die. Jack seems to realize this too. Jack: "That is unfortuante." Angelica: "Yes, it is." Jack: "I find my desire for the Fountain greatly lessened." Now they're going back onto the dirty ground of the deck. Angelica: "But there is something onbaord you do want." Jack then agrees to help Angelica and her father to the fountain in return for the Black Pearl. As they continue with the mermaid through the forest to the fountain, Jack brings up the ritual again in hopes that maybe he had misunderstood it the first time. Jack: "What is the ritual again? Water from the Fountain and a mermaid's tear?" This time Angelica doesn't hold back. Angelica: "And two silver chalices. One cup with a tear, one without." Jack: "So one with a tear and water in both. Quite complicated, is it not?" Angelica: "both get water. One gets a tear. Ther person who drinks the water with the tear gets all the years of the life from the other." Blackbeard is in the background staring menacingly and eavesdroping. Jack: "How many years? Whoa." Angelica decides to pull a snake out of the swamp for dramatic effect. Angelica: "All the yers that they have lived, and they could have lived if fate had been kinder." So basically, you haul along a friend of yours to the fountain with a mermaid. Place the tear in one of the two chalices with the magical water. Each person drinks randomly. One person lives for many more years, the other dies, right there. What a task! Would you take that risk?